and embellish as I see fit". quite a challenge. So here is what I came up with! and the celebration of the day of Christmas. with splashes of red and deep maroon. delightful little red breasted robins. in the end! What do you think? laces in varying shades of white, cream and blue. accidentally also lost all of her 1000 plus followers. If you were a follower of Karen's blog and have noticed that she is gone -- you can now find her here at her new blog location! who might also be following Karen. Can you imagine how upsetting this incident could be? wonderful to see new followers too. Much happiness in your Christmas creating activities! 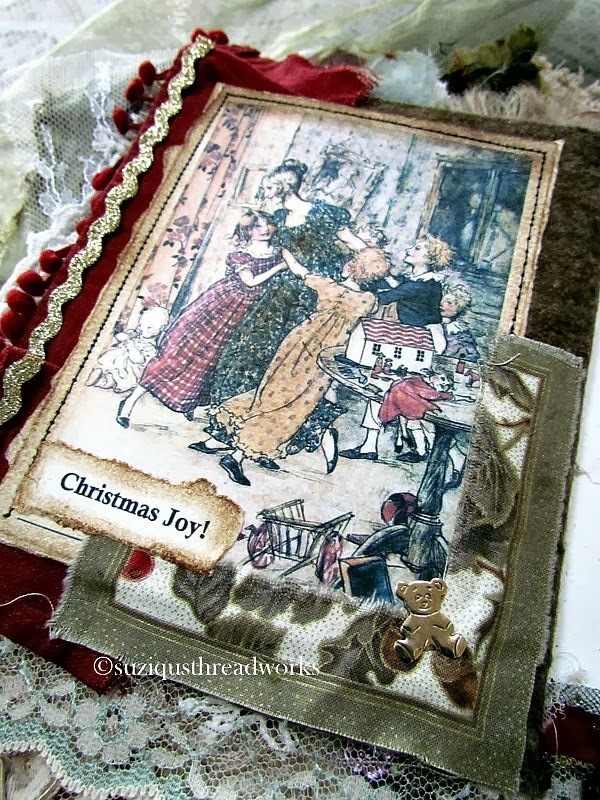 Labels: Christmas Lace Book/Journal. 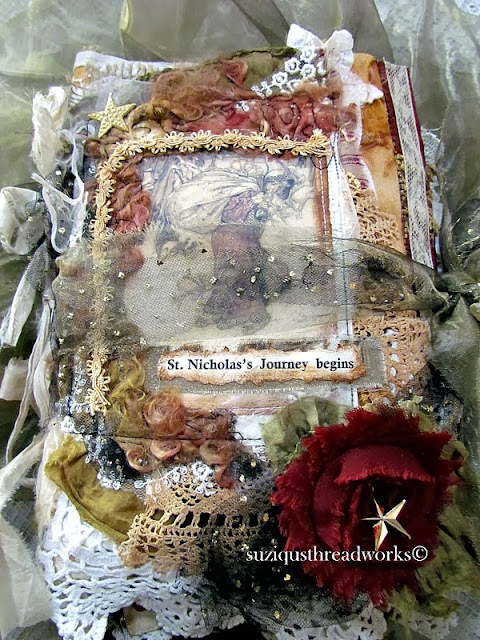 St. Nicholas's Journey. Bells, teddies and toys. Arthur Rackham images. Todolwen new blog link. Wahoo Suzy, wha a wonderful book! I love Arthur Rackham pictures too very much, you know it! Your creation is very beautiful! Totally charming - it's a work of a ART! it's a magical story and you've created such beauty and magic around the exquisite Arthur Rackham images. I wish it was mine!!! You've surpassed yourself this time Suzie.....It is utterley devine and I can see it as a heirloom piece! Imagine one christmas day, many years from now, a child or elative being given this work of art and told it was made by a textile/media artist in the early 21st century! WOWWWWWW Suzy! SO SO BEAUTIFUL!!!! I just love your latest creation .. it is beyond beautiful! Also thank you so much for letting everyone know where to find me again! 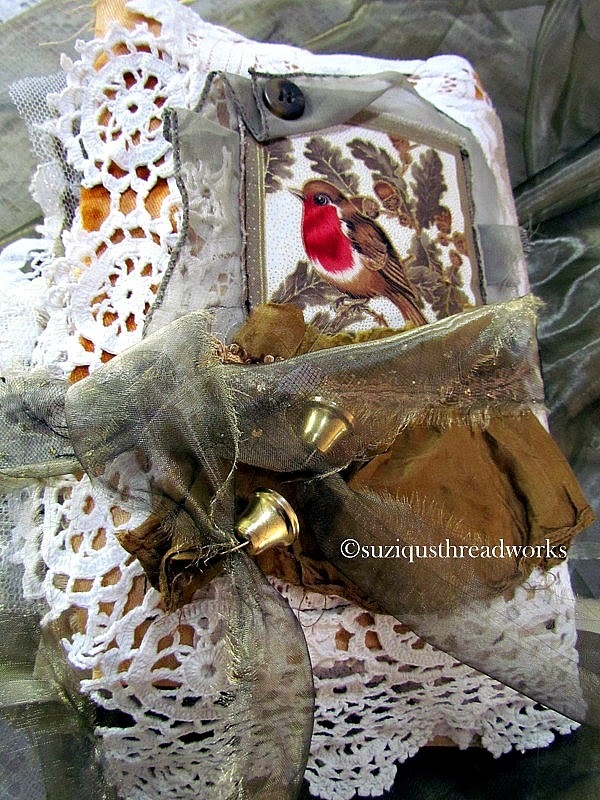 Suzy I really love your Christmas book-just so magical. 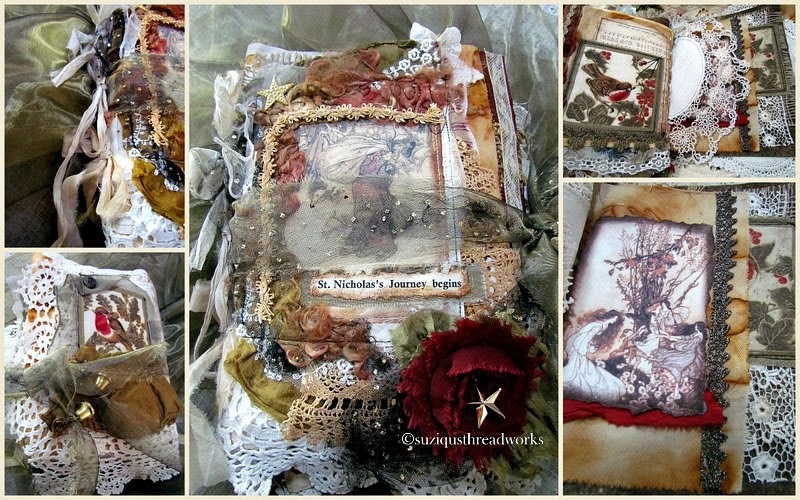 What a beautiful keepsake you have created! You have such a good eye for adding all your bits of magic! wow, this is a warm beautiful loving designed beauty!!! thanks for sharing the warmth. 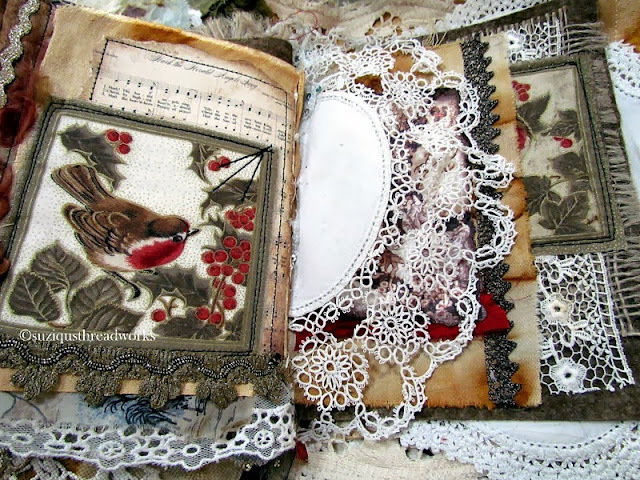 Your lace book is stunning and I am sure she will be very please with it!! What a gorgeous Christmas Book. I'm sure it will be cherished and become part of the owner's Christmas tradition. The attention to the smallest details, and all the lace make it especially drool-worthy! Happy Holiday Season. Hello dearest Suzy, The colors you chose go very well together and are just perfect for that Christmas book. 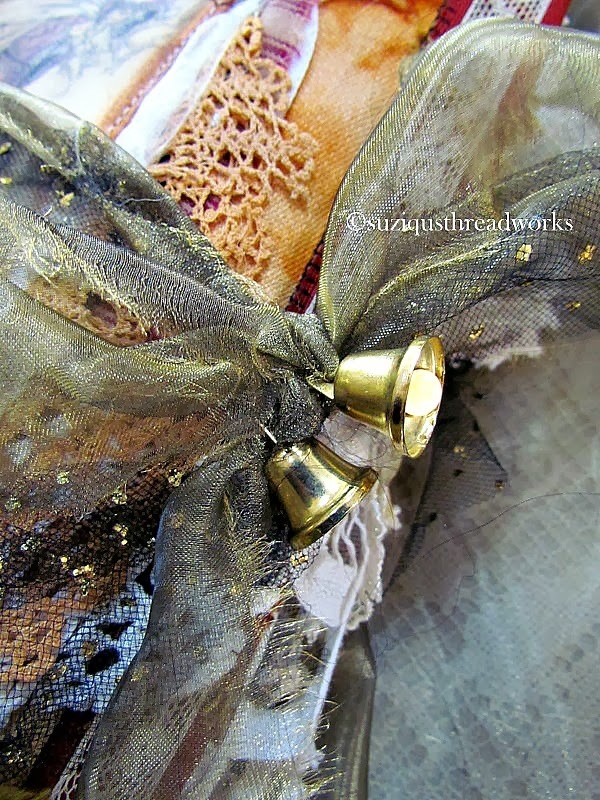 Each page turned out very beautiful and all the layers of fabrics and laces are such eye-candies. Your customer must be thrilled about the gorgeous book. Have a wonderful week, sweetie! PS: Thank you very much for your message. I'll get back to you soon. So incredibly beautiful designed, dear Suzy! This was determined an extensive work. I am totally thrilled! 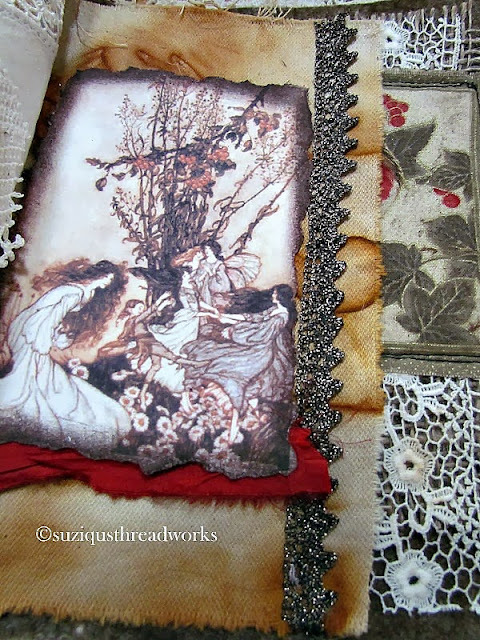 Such a beautiful fabric book. A feast for the eyes! I'm glad you're back after those sad days. Your work is gorgeous as ever. I love the book with all the lace and silk. So beautiful with all the tiny details and colour tips like the red robin. Your Christmas inspired book is magical! Wow! 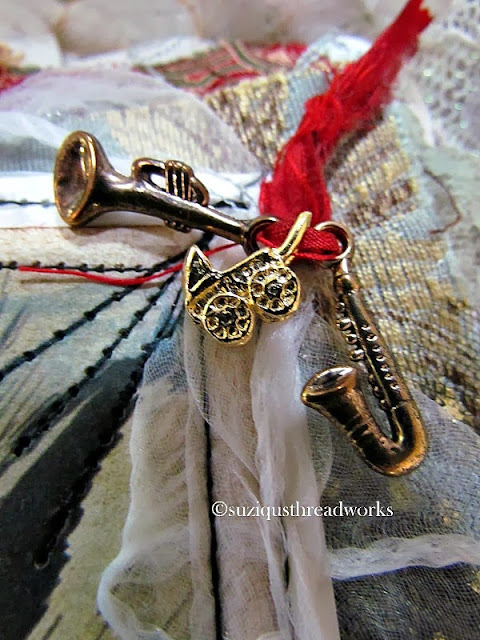 I am loving the golds, the bells, and the goat hair too. All that luscious lace on every page really makes it glorious. What a daunting task and you did it so beautifully! What a beautiful, rich looking journal. I love it. You did a wonderful job as always. St. Nick never looked so good, sitting in the middle of all those beautiful laces and ribbon embellishments. Quite a challenge, but it looks fantastic. Merry Christmas. Oh my, another stunning book Suzy! I love everything about this lovely book. I think you did a superb job in gathering/making this lovely book for your client. All the lace, ribbons, sari silk, silkies and doilies just go perfectly. And I really loved seeing the little red breasted robin in there, a perfect addition to this piece. Your client will be so happy to have this book in her collection. Job well done. Oh Suzy - what a God given talent you have. 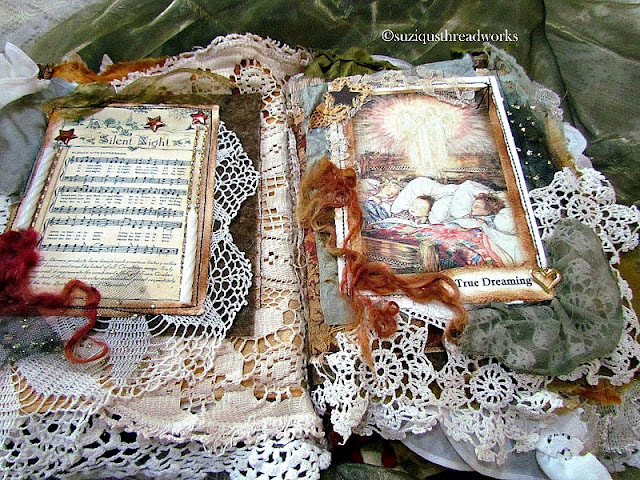 This beautiful book is just breath taking, and every page has such exquisite detail- how could you ever bear to give it away - it would break my heart if I had made it! Do you use actual 'rust' to die your materials or mix a dye of colours to represent rust? I can't stop looking at your photos of it. OH MY! This should be a lesson for everyone...when you are allowed free rein, incredible beauty flows from your hands. I surely feel as though I have take a step into Christmas past. You captured the essence of a nostalgic Christmas, not purely on the images you created with but with those glorious warm shades you incorporated, the richness exude warmth and love and all those delightful charms and I so adore that you incorporated mohair from your goats, how fabulous. I wish we could have seen the expression on the face of the customer who commissioned this art! Just love Arthur Rackham's drawings!You have combined them in a magical work which will surely delight your customer!Great colours, and trimmings. thanks for the info about Karen's blog. I did find her through another blog and now can update my link to her blog from mine. I appreciate your help! Be still my heart!!! This book so beautifully depicts the joys and the magic of Christmas! Oh what can I say,!!! just another amazingly created ,stunning book. I love the drawings from Arthur Rackham`s hand, and the choises of fabric you made to go with them. The gold compliment all the rust so wonderfully, and using tiny charms gives the book all the magic of christmas. 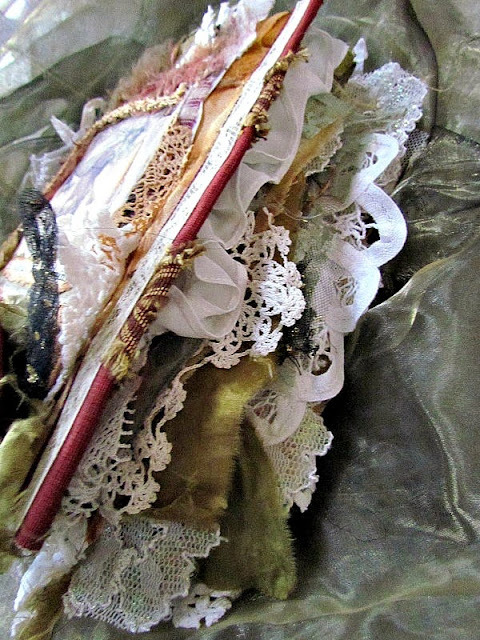 Also love the beautiful mohair , and all the laces - it wouldn`t be you without huge amounts of gorgeous lace. Your costumer, will not lay this book away after christmas, but surely enjoy it all the coming year,too - my sweet clever friend. Sending you much love and hugs. This Christmas Lace Book is so beautiful. 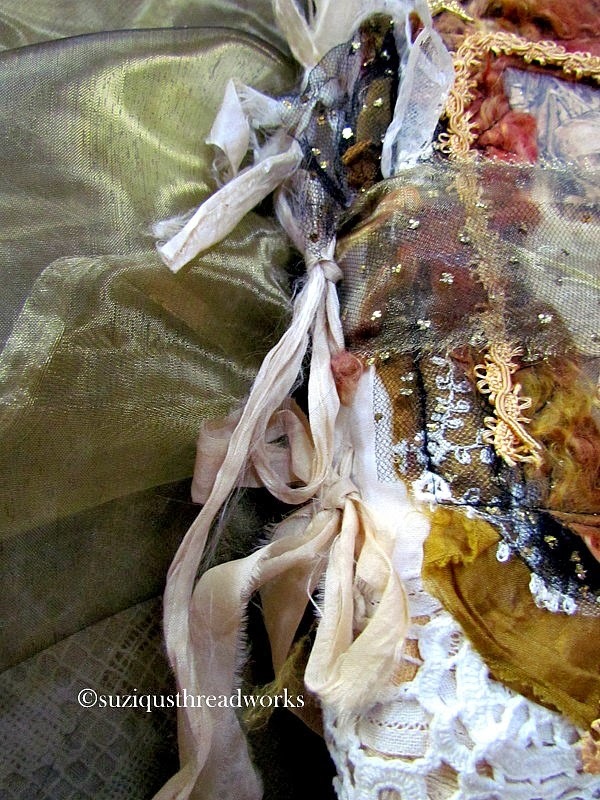 Lovely how all the illustrations, colors, lace and fabrics come together. I think it came together far more than reasonably well! Suzy, your book is incredibly gorgeous! 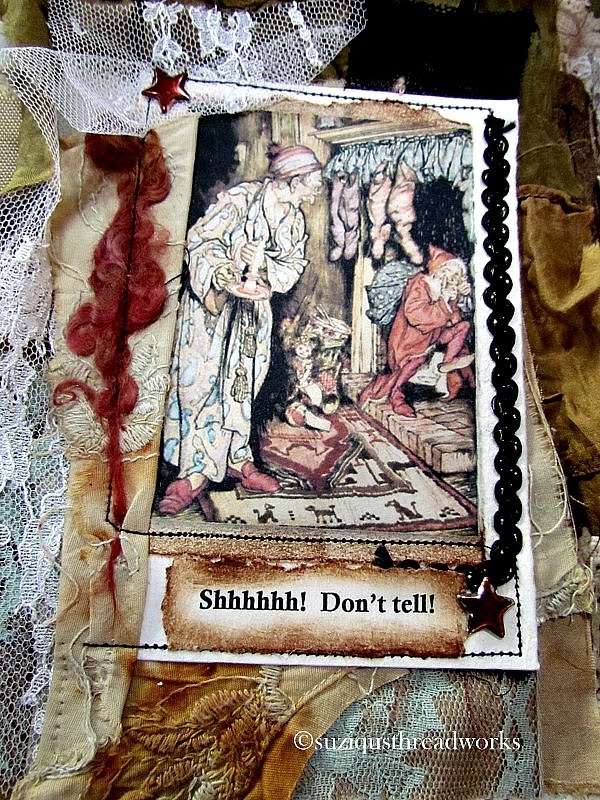 I adore how you have incorporated the page colors together with the fabrics, you have captured the total feel of the story with your magic! I can imagine this book year after year gently being placed by the Christmas tree or in a Christmas vignette, and year after year being opened and each page adored and carefully touched by many gentle hands. This is the most perfect and beautiful Christmas heirloom. The Christmas images are absolutely charming and you've made them even more delightful with your additions! The little robins are perfect. Whow, whow I love the holiday book, so beautiful indeed.